Review by AllTheBestFights.com: 2016-11-04, fight not particularly good between Manuel Avila and Jose Ramirez: it gets two stars. The undefeated Manuel Avila entered this fight with a perfect boxing record of 21-0-0 (8 knockouts) and he is ranked as the No.22 featherweight in the world while his opponent, Jose Ramirez, has an official record of 28-6-0 (16 knockouts). Both boxers have fought twice in 2016: Avila has won over Rene Alvarado (=Avila vs Alvarado) and Prosper Ankrah while Ramirez has beat Juan Luis Hernandez and Giovanni Caro. 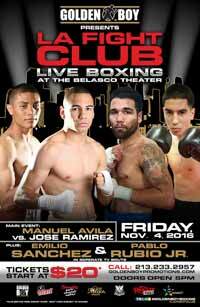 ‘Tino’ Avila vs Ramirez is the main event of the evening. Watch the video and rate this fight!